December 13: Big Picture: Same Financial Recipe as August 2015? Last Weekly Research: Resuming January 10 2016. My Proxy for me is the CEW ETF ( ​​WisdomTree Emerging Currency Strategy Fund ) which is down 10.2% from a year ago as shown by the chart below. 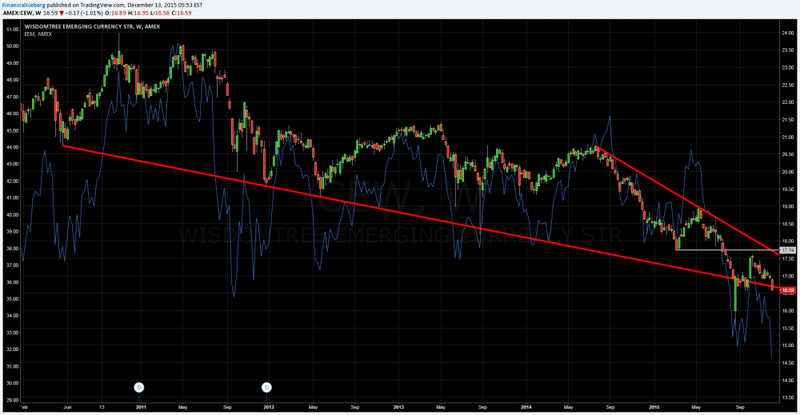 Also keeping an eye on the EEM ETF ( iShares MSCI Emerging Markets ETF - Blue Line Chart Below ). 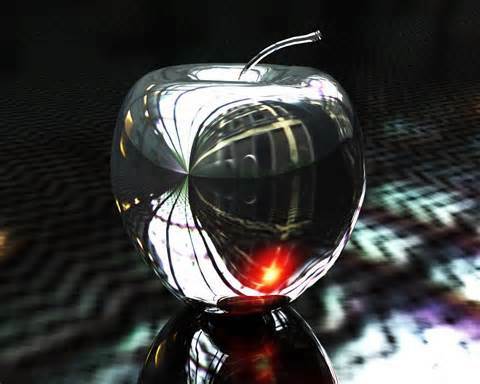 ​That will keep pressure on Apple in terms of growth ( price increases vs market share vs competition ). RV closed on December 11 at ​​1.37, well below it s 200 DMA at 1.88 and pure Volatility​ closed at 33.38% last Friday, level well above its 200 DMA at 30.1%. ​​That Trendline becomes resistance at a level of $117.03 for December 14. 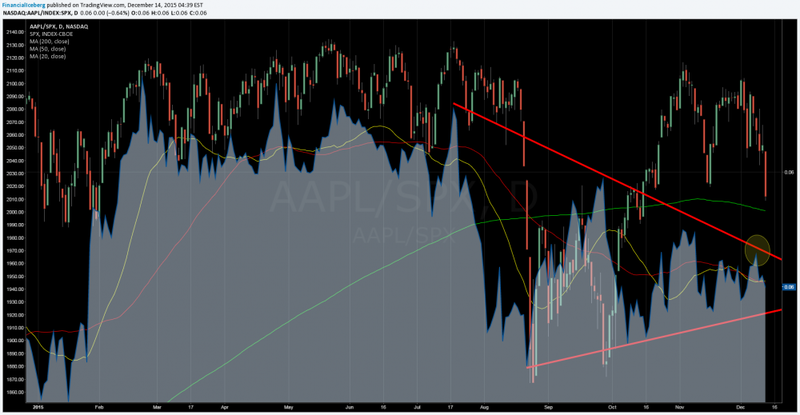 ​​Apple Shares are testing another support trendline that started back on October 1 which is $113.14 for December 14. IF we break that support trendline, the risk is retesting the $107.30 to $109.50 zone before resuming uptrend. We are witihin a huge wedge pattern on a Relative Basis that started back on July 20 2015. We tested again the $119.75 last week and failed to stay above that level on a weekly basis ( which is the old weekly resistance level back from November 24 2014 - chart below - Red Trendline )​​ to stay to a Macro bull behavior trend. Also take note that the Weekly Support Trendline from an upward Channel that started back on September 28 week 2015 is at $116.62 and was broken last week. ​​​For the weekly, we are now within a downtrend channel that started on the week of November 2 with $107.88 as support and $119.27 as resistance. See chart below.